Mormon Moms: Spring Forward - Daylight Savings - Everlasting LIGHT! 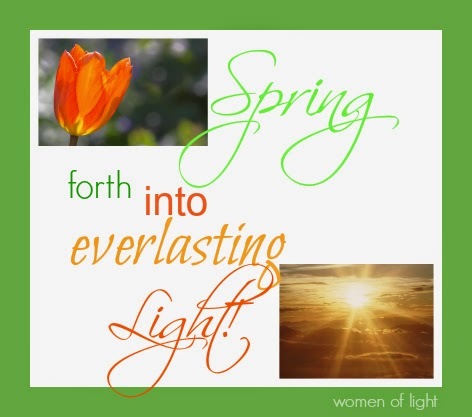 Spring Forward - Daylight Savings - Everlasting LIGHT! What can we learn from it and how can it be symbolic for us? "....on this bright and beautiful day, I should like to address the subject of light. The dictionary defines light as something that makes vision possible or something that enlightens or informs. Two types of light are physical light and spiritual light. Physical light, especially natural light, affects the moods of people. When summer’s light begins to fade, days grow shorter, and the winter season looms darkly ahead, natural light becomes a more precious commodity, especially to people who live in extreme northern climates. There, where darkness reigns for up to three months a year and then summer blooms into three months of constant daylight, moods swing with the seasons. Light does have a profound effect on human mood and behavior. Mounting evidence indicates that people who are feeling a little down and need a lift can get it by going outside in daylight. Walking in the light is a natural mood booster. Many who simply walk for half an hour or more during the daylight hours receive a distinct benefit. Scientists are not entirely certain which wavelengths cause light’s mood-boosting effects. Researchers believe that these effects are traceable to light taken in through the eyes and not through the skin. A second medical use of light is light therapy for treating some cancers. Certain chemicals combined with light can destroy cancer cells. Research is under way to identify the best source of light and to determine how to direct it to body areas. Lord is my light and my salvation: Ps. 27:1 . Lord shall be … an everlasting light: Isa. 60:19 . A light to lighten the Gentiles: Luke 2:32 .
the life was the light of men: John 1:4 .
true Light, which lighteth every man: John 1:9 . Christ shall give thee light: Eph. 5:14 . Lamb is the light: Rev. 21:23 . I will be a light unto them forever: 2 Ne. 10:14 . I am the law, and the light: 3 Ne. 15:9 . I am the light which ye shall hold up: 3 Ne. 18:24 . I am the light, and the life, and the truth: Ether 4:12 . I am the light which shineth in darkness: D&C 6:21 .
truth is light, and whatsoever is light: D&C 84:45 . The light and the Redeemer of the world: D&C 93:9 .